"For millions of people up and down the country using a train is a daily necessity, and it is absolutely vital that they know they can travel safely without the senseless threat of knife crime. "It is fantastic to see first-hand how the invaluable work of British Transport Police officers is cracking down on this issue, ensuring passengers can have total confidence in a safe and secure journey." 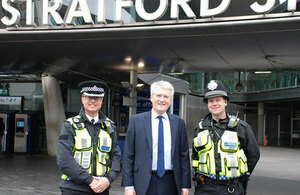 "Millions of people use the railways every day and our officers are on hand 24/7 to help keep them safe. "Over the last year we have increased our targeted, intelligence-led operations against knife crime. These patrols, which often involve knife arches, metal detectors, plain clothed and uniformed officers, have been paramount in taking knives off our rail network. "Around half of all knife crime we record is as a result of weapons our officers have seized and importantly, these successful operations also act as a deterrent to those intent on carrying weapons, and help us to keep passengers and staff safe."